North Korea's sole female alpine skier at the PyeongChang Winter Olympics said Friday she is expecting to make friends during her stay in South Korea. 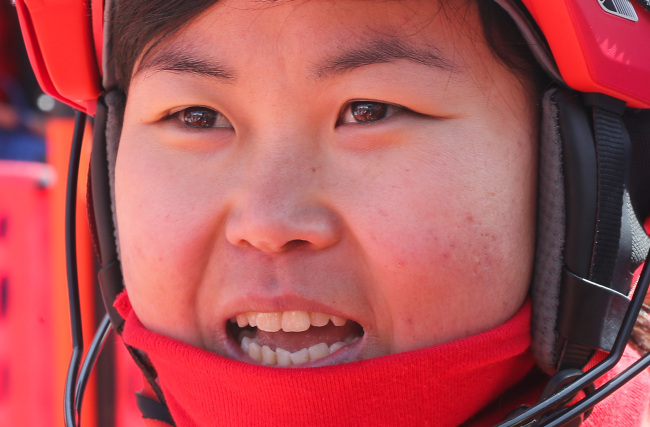 Kim Ryon-hyang, who competes in the women's alpine technical events, told reporters that she has yet to make friends from other countries but is looking to make one. "I have yet to make friends (from other countries)," she said after finishing her first run in the women's slalom event at Yongpyong Alpine Centre in PyeongChang, some 180 kilometers east of Seoul. "(But) we're going to be (friends). I've gained new experiences by participating in the Olympics." Kim finished last among 59 skiers who completed their first run, with a time of 1 minute, 18.17 seconds, which was 29.28 seconds behind the leader Wendy Holdener of Switzerland. On Thursday, she was disqualified from the women's giant slalom event following a false start in her second run. "I'm not satisfied with my results," she said. "But I'm going to do better later." Kim was supported by tens of North Korean cheerleaders, who chanted slogans like "We're one." The North's cheering squad was also at the alpine venue Thursday. Some South Koreans also joined North Koreans' cheerleading actions. "Because the North and the South supported together, I feel light and happy," she said. "I came here with a belief that our beloved supreme leader (Kim Jong-un) is watching me." Kim said she thought of a unified Korea after hearing the cheering squad chanting, "We're one." "I thought if the North and the South are unified, we can make a strong team," she said. "I hope other athletes don't forget the slogan 'We're one,' and that the North and the South share one blood."